With all our curiosity we started episode 2. It was the scene where a child was waiting for his mom to cross the road and come over but suddenly he saw a bad energy turned into scary ghostess who pushed the mother on the road. It was Bong Pal childhood memories he remember how he lost her mother in an car accident due to a bad ghostess. We were amazed to knew Bong Pal has the powers to see the Ghost from his childhood. The Ghostess didn't leave that child alone even on his mother memorial. She scared him and didn't stop there even at school. She made Bong Pal scared and miserable as well. Made him begging to leave him alone. The story get quite interesting when the Kiss encounter starts again. 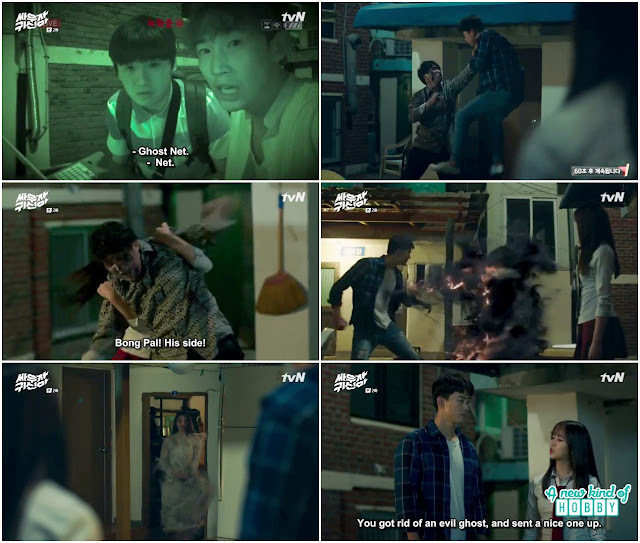 The Ghostess Kim Hyun Ji again tries to kiss Bong Pal and got hit on her head. She didn't leave him alone enters his house and beg him for the favor. Their conversation was quite interesting we enjoyed. To my sister it seems like the sequence of Oh My Ghostess. She annoyed Bong Pal alot and end up when Bong Pal ask her where is my 10,000 dollars. 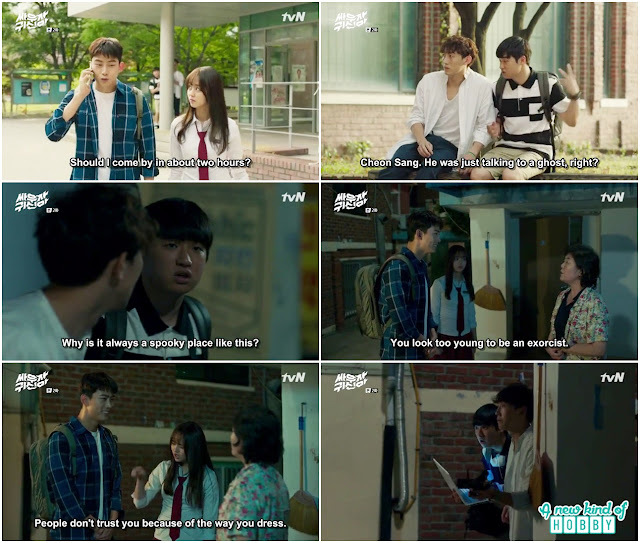 It was Ghostess Oh Kyung-Ja the unni of Hyun Ji who also wondering and giving a tought time to the male she was in love. Accidentaly she saw professor Joo Hye-Sung and says Honey. So from now on she was after the professor. But its a mystery will she able to hit Professor like she did before to the other men. We enjoyed the rooftop scene where Bong pal exercise and Hyun Ji gives him a tough time saying for the favor and to share the food with her. So its the only thing Bong Pal tease her. But finally end up giving her food. It was another hilarious scene when the Ghostnet Guys trying to follow Bong Pal to knew wether he can really see ghost or not. Watching him from a place they found out that he is talking to the Ghost. So they plan to follow him, film the ghost fight and earn a lot of money. But Bong Pal scold Hyun Ji saying don't try to follow me, the Ghostnet friend got scared that he knew they are following. They act like fools and sit on the bench to wait for someone. But Bong was called in by some Ajhumma who runs an inn and was in trouble for the business due to haunted ghosts at her place. She didn't belive Bong Pal to be Excorcist but Bong Pal said you don't need to pay me now you can wire the money to my account after i finish off the ghost. The Ghostnet guys follow him and start filming. All they can see the fight of Bong Pal but there was the fight of two Ghost and Bong Pal. It was another scary and stary Ghost who was also more powerful then Bong Pal. The Ghostness guys were doing a live commentary on internet while shooting the fight. They receive so many bad comments some one also commented did you hire an actor? He must receive an oscar. With Hyun Ji help they fight the scary Ghost she saw his weakness and shout Bong Pal hit him here. When they finish off the ghost the female cabinet Ghostess appear and thank them for helping her rest in peace. On the way back Bong pal found Monk Myung-Chul's Ghost hunting Weapon and become curious why this weapon happened to be here. Finally he realize he can't chase the bad ghost by himself without Hyun Ji's help. So he ask her how could she able to see the weakness of Ghost? Hyun Ji do you want to learn? .. but i won't tell you. Bong Pal ask her why she is following him? Is it that she want to knew something from the memories. The Ghostess replied its being 5 years of my death and i don't know the reason why i am wondering like this? If we could do it again we did it before so i could remember anything. Bong Pal tease her to tell in detail what they did? She blushed and feel shy couldn't able to say. Bong Pal suddenly react and kissed her. It was their second kiss. Ghostess and us shocked Bong Pal rocked. Let's meet in the next episode review to unfold the mystery of Let's Fight Ghost and what happened after Bong Pal and Hyun Ji Kiss.